Table of Contents Next: Wolfe, Kenneth B.
Woleai (143.91E 7.376N) is an atoll in the central Carolines. It is about 7 miles (12 km) long and 4 miles (7 km) wide. The Japanese had built an airfield here with a 3,290' (1000 meter) runway, and there was a decent anchorage in the western end of the lagoon. The island was scheduled to be invaded on 15 July 1944, to help cover the lines of communication from the Marshalls to the Marianas. However, these plans were abandoned in March 1944. 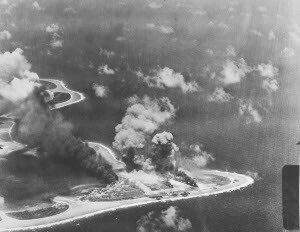 Instead, the atoll was heavily attacked by aircraft from three carrier groups returning from a raid on Palau, on 1 April 1944, and was then bypassed by the Allied counteroffensive.